Howell Edmunds Jackson was a U.S. senator, federal judge on the U.S. Sixth Circuit Court of Appeals, and U.S. Supreme Court justice. Jackson toiled diligently without fanfare for many years before garnering widespread attention for the last case he heard while sitting on the Supreme Court, pollock v. farmers' loan & trust co., 158 U.S. 601, 15 S. Ct. 912, 39 L. Ed. 1108 (1895). Jackson was born April 8, 1832, in Paris, Tennessee. He graduated from West Tennessee College in 1849, then studied for a time at the University of Virginia. He read the law with a Tennessee Supreme Court judge for a year, and obtained his law degree from Cumberland University in Lebanon, Tennessee, in 1856. Thereafter, he practiced law in Jackson and Memphis. Although Jackson opposed Tennessee's secession in the Civil War, he served the Confederacy as a receiver of confiscated property. Following the Civil War, he served for a short time on the Court of Arbitration for West Tennessee, a provisional court helping the regular Tennessee Supreme Court dispose of a backlog of cases caused by the war. He also made an unsuccessful bid for a seat on the state supreme court. A Whig before the war, Jackson was elected to the Tennessee state legislature as a Democrat in 1880. The following year the legislature assembled to choose a U.S. senator on a joint ballot. No candidate, including the incumbent, could muster enough votes in the divided assembly. After a number of deadlocked days, a Republican legislator cast his vote for Jackson, who had not been a candidate, and Jackson was quickly elected. In the Senate he gained a reputation as a tireless worker. He was nonpartisan in his friendships, becoming close with Democrat president grover cleveland and Republican Senate colleague Benjamin Harrison. Jackson resigned from the Senate in 1886 when President Cleveland appointed him to the Sixth Circuit Court of Appeals, and eventually became that court's presiding judge. In 1893 lame-duck president Harrison appointed Jackson to fill a vacancy on the U.S. Supreme Court. Harrison appointed Jackson in part because Cleveland was about to become president, and Harrison doubted that any Republican could garner confirmation by the Democratic Senate. Harrison, a former Union general, saw in Jackson, a former member of the Confederate government, not another secessionist southern Democrat but a man committed to serving his entire nation. In August 1894, Congress imposed a nationwide two percent Income Tax on all annual incomes in excess of $4,000. The new law, popular in the South and West but despised in the North and East, was quickly challenged as being unconstitutional. Soon, the Supreme Court agreed to hear the case. Tuberculosis struck Jackson, and shortly after the October 1894 session began, his deteriorating health kept him off the bench. He was absent in April 1895 when the Court held in Pollock that part of the new tax law was unconstitutional. The Court was evenly divided on whether the entire law must be declared unconstitutional, and therefore did not express an opinion on the matter. The absence of a firm decision by the justices meant that the courts could expect a flood of litigation from unwilling taxpayers. The Supreme Court quickly granted a rehearing to reexamine the issue. To break the deadlock, it appeared essential that Justice Jackson either resign so that a new justice could be appointed, or agree to hear the case. Jackson decided to hear the case. 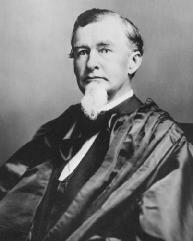 At Chief Justice Melville W. Fuller's insistence, he obtained his doctor's permission to travel from Tennessee, where he had been recuperating, to Washington, D.C., to return to the bench. The case was argued for three days in early May, 1895. Strong passions about the income tax law, widespread speculation about how Jackson would vote, and the drama of the obviously ailing justice made the case one of keen public interest. Reporters speculated that the effort of participating in the hearing might well shorten Jackson's life. The decision was rendered less than two weeks after oral arguments. Ironically, Jackson's vote was not crucial, because one of his colleagues changed his opinion. Jackson and three other justices voted to uphold the constitutionality of the tax; five justices, including the colleague who had changed his opinion, voted to declare the entire law void. Jackson, too weak to prepare a formal, written opinion, spoke from notes as he announced his dissent in the Supreme Court chamber. Jackson declared that the decision was "the most disastrous blow ever struck at the constitutional power of Congress." An income tax was not resurrected until passage of the Sixteenth Amendment in 1913. "[The pollock] decision disregards the well-established canon … that an act passed by aco-ordinate branch of the government has every presumption in its favor, and should never be declared invalid by the courts unless its repugnancy to the constitution is clear beyond all reasonable doubt." After the rehearing in Pollock, Jackson returned to his home in West Meade, Tennessee. He died less than three months later, on August 8, 1895.